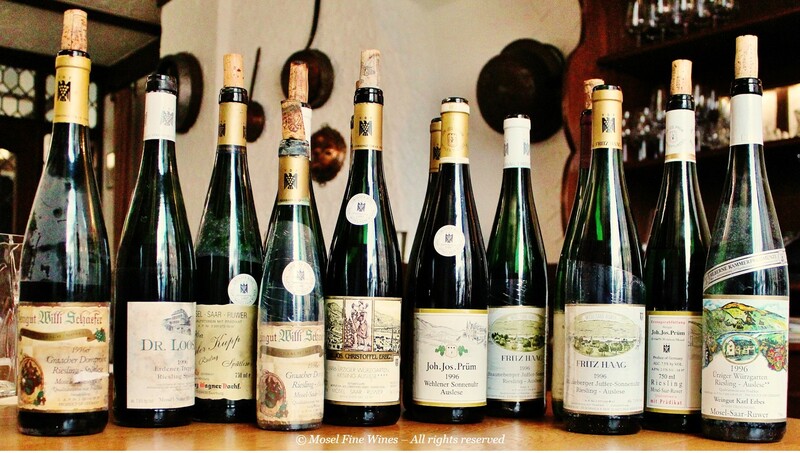 Our extensive 1996 “20-Years-After” made us uncover plenty of gorgeously racy and fresh Mosel Riesling to enjoy now. This includes the largest 20-Years-After retrospective made anywhere in the world. The focus this year was the 1996 vintage. The growing season of 1996 was all but easy. Late flowering and a cool summer made acidity stay high and delayed ripeness well into the later part of October. Thankfully, a streak of “Golden October” (cool sunny weather) saved the vintage at the very last moment for those who had the nerves to wait. We re-sampled over 50 wines, sometimes whole collections, from many leading Estates of the day including Joh. Jos. Christoffel Erben, Jos. Christoffel jr., Fritz Haag, Schloss Lieser, Joh. Jos. Prüm, Max Ferd. Richter, Willi Schaefer and von Schubert. The vintage still drinks beautifully well today. Its wines shine through racy freshness. There is firm acidity, but this actually only proves an issue for lesser wines. The sweet spot of the vintage is clearly at and above Auslese level. Here, the additional touch of creaminess found in these wines provides the ideal balance to the crisp acidity. Some Eiswein are among the best ever made. The complete 1996 Riesling Retrospective including full tasting notes for 150 wines was published in Mosel Fine Wines Issue No 30 (Mar 2016).